Earlier it had not been clear from the official Apple sources that when Apple Watch is available in stores. Now eventually it has been seen on Australian Apple store that it is available in stores from 17th June 17, 2015. The expected reason behind the uncertainty about its availability in physical stores is that it might not available easily as other Apple products because customer has to reserve it first from online Apple store then able to purchase it from the nearby store. It means that customers don’t try to walk-in as they will not be able to purchase their watch. This is all due to the massive pre-orders made for the apple watch earlier and Apple is trying to fix the inventory issues. As far as availability of Apple Watch is concerned, it highly depends upon the model because it may possible that the model you are looking for is not available so in that case you will have to either wait or go for another one. This issue will be fixed when Apple fulfills all the pre-orders. Therefore, there are various reasons behind the silent announcement of the Apple Watch availability in stores including unavailability of few models. 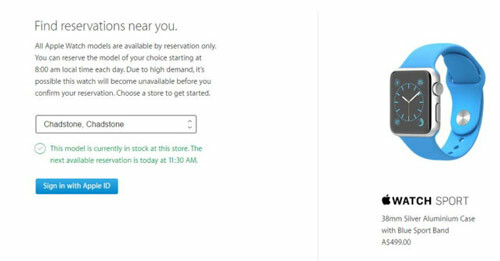 Hopefully before walk-ins will allow, Apple will officially announce the availability of its device in stores.